If you’re already an iPhone owner like I am, September 18 is a pretty big day: It’s when Apple finally allows us all to download iOS 7, the gorgeous new smartphone operating system. If you’ve got a iPhone 4, 4S, or 5, you’ll be treated to a number of cool new features, including iTunes radio, built-in photography tools and automatically updating apps. Unfortunately, those of you holding an iPhone 3GS or earlier won’t be able to get the new operating system – your phone just doesn’t have the processing power to handle it. But that doesn’t mean iPhone 3GS owners don’t have an important bit of updating to do today. Apple is now offering owners of older devices with out-of-date operating systems the ability to update apps to the last compatible version that works with your device. The only catch: Your phone’s current operating system must at least be updated to iOS 4 (released June 21, 2010). If you’ve got an older iPod touch, first-generation iPad, iPhone 3G or 3GS sitting around (or if you handed one down to your kids), now’s the time to dust it off and bring it up to date best you can, app-by-app. Certain programs won’t be usable, even with the update – Instagram’s servers, for example, won’t let you log in with an older iOS build regardless of the app’s version. 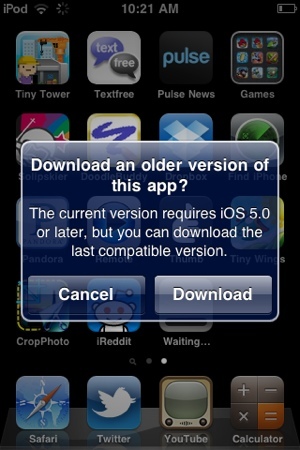 Still, this lets you update popular apps like Facebook and Whatsapp to breathe new life into an older device.